This article is too long and written in a way that could be more direct, but it still makes some good points. 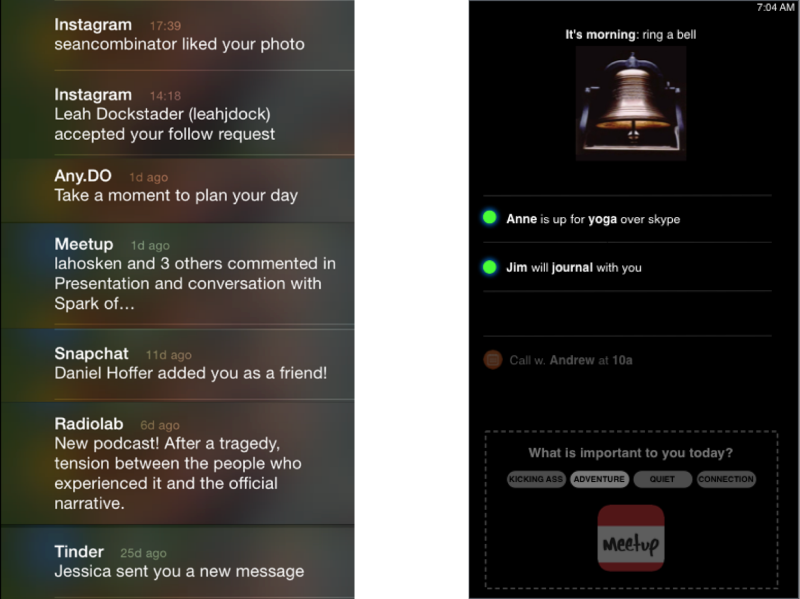 Perhaps the best bit is the comparison of iOS lockscreen (left) with a redesigned one (right). Most platforms encourage us to act against our values: less humbly, less honestly, less thoughtfully, and so on. Using these platforms while sticking to our values would mean constantly fighting their design. Unless we’re prepared for that fight, we’ll regret our choices. When we’re joining in with conversations online, then we’re not always part of a group, sometimes we’re part of a network. It seems to me like most of the points the author is making pertain to social networks like Facebook, as opposed to those like Twitter and Mastodon. Groups are held together by a particular kind of conversation, which I’ll call wisdom. It’s a kind of conversation that people are starved for right now—even amidst nonstop communication, amidst a torrent of articles, videos, and posts. When this type of conversation is missing, people feel that no one understands or cares about what’s important to them. People feel their values are unheeded and unrecognized. [T]his situation is easy to exploit, and the media and fake news ecosystems have done just that. As a result, conversations become ideological and polarized, and elections are manipulated. Tribal politics in social networks are caused by people not having strong offline affinity groups, so they seek their ‘tribe’ online. If social platforms can make it easier to share our personal values (like small town living) directly, and to acknowledge one another and rally around them, we won’t need to turn them into ideologies or articles. This would do more to heal politics and media than any “fake news” initiative. To do this, designers need to know what this kind of conversation sounds like, how to encourage it, and how to avoid drowning it out.